The plugin certification process involves an in depth review of the source code. It is checked for any possible vulnerabilities that could put your site at risk. After the certification process is complete, any discrepancies will be sent to the plugin author. If communication with Author of plugin does not result in the plugin being fixed then the plugin will be available on this site modified and clean of any vulnerabilities. 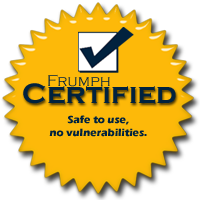 Leave a comment on this page/site, email me, or find me on twitter @frumph to which plugin you would like to have certified. Not contain any errors/warnings/notices or deprecated messages. Does not contain any security vulnerabilities. Utilizes the latest WordPress code and functionality. Currently certified (13) plugins, all authors have gladly accepted the changes to their code so they’re on the repository. This is a FREE service, although donations of course are accepted. Well the latest updated on it is 6-16-2010 which by current standards that’s relatively still in the realm of being updated for wordpress 3.0, I’ll get on it tonight. EDIT: While I found some ‘shakey’ possible vulnerabilities, nothing that stands out. However, I did find that this plugin is really written in a way that could be done quite a bit better by utilizing core code. I’m going to put it on my to-do list to clean it up. Thank you Phil. You set my mind at ease. I look forward to downloading the improved version. I’d love to know if WP Ajax Newsletter is vulnerable. Looks a bit troublesome since it writes to the database from an input field. Have you looked at this one yet? No I haven’t looked at that one yet, haven’t had a need to, got a wordpress.org link for it? And I just saw “compatible with 2.0.” That’s probably not a good sign.